When you open search.mapsworldsearch.com, the page looks like one of your average map sites that can help you plan your trip or find the actual location of your destination. However, the site is associated with the MapsWorldSearch adware program. You probably found this description because you want to remove MapsWorldSearch. You have come to the right place because we will tell you exactly what you need to do to get rid of this application. Scroll down to the bottom of this description for the manual removal instructions and make sure your computer is clean and safe again. The moment this adware program enters your system it creates a shortcut on your desktop to search.mapsworldsearch.com. However, some users think that MapsWorldSearch is a dangerous infection because they do not notice when or how the application gets installed on their computers. Although it may not be possible download the app from the official website, it does not mean the adware app does not have other distribution methods at its disposal. After all, it managed to slither into your system, did it not? To put it simply, the app jumped into a band wagon and came with some other freeware app you have recently installed. At the same time it means that MapsWorldSearch is definitely not the only uninvited guest on-board. You will have to scan your PC with the SpyHunter free scanner to determine just how many unwanted programs are running on your system. 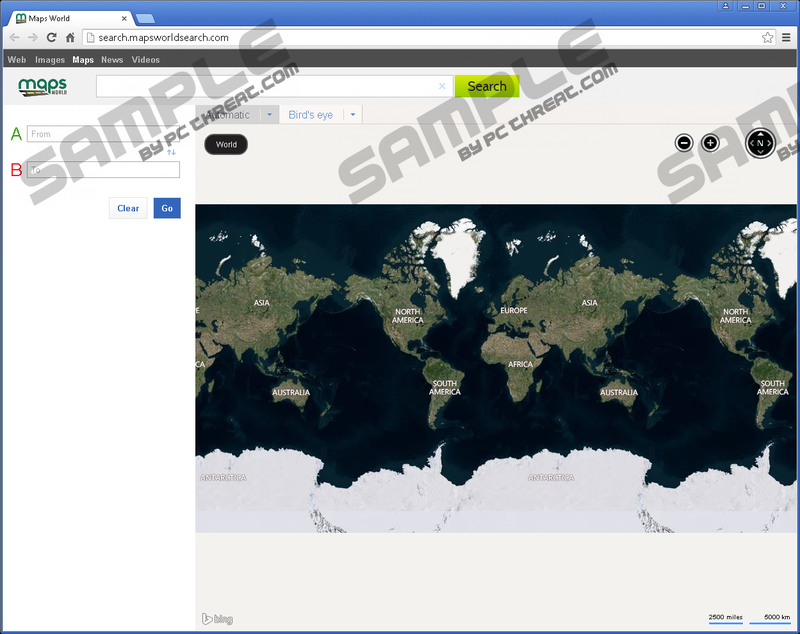 Judging only from the official website, MapsWorldSearch does look like one of the best map tools out there. It even gives you random Earth facts that should peak your interest in travelling or map analysis. For example, the information on the site says that “the total land area accounts for about 29.1% of the Earth’s surface,” and that “at any point, 10% of the Earth’s surface is under ice.” Now, that is quite interesting and all, but is it of actual use to you? Most probably not, just like the pop-up ads displayed by this application. At any point during your web browsing, you will be exposed to third-party commercial ads by MapsWorldSearch. Our problem with these ads is that the application itself does not check whether they are safe or not. The moment you click any of the ads, you enter an unknown territory, and if you happen to experience a malware attack afterward, you will have no one but yourself to blame. Almost all adware programs maintain that they are not responsible for the security of third-part content, so you have to take your computer’s security into your hands and deal with this situation immediately. If you are not confident you can remove MapsWorldSearch on your own, get yourself a licensed antispyware tool. Not only will it help you delete all the unfamiliar applications from your PC, but it will also protect your system against similar infections in the future. You also need to employ safe web browsing habits so that you would not download such programs accidentally. What’s more, whenever you install an application downloaded from an unfamiliar source, be sure to read all the installation steps carefully. For other tips, do not hesitate to leave us a comment. Highlight MapsWorldSearch and click Uninstall. Go to Uninstall a program and remove MapsWorldSearch. Navigate to Add or remove programs and uninstall MapsWorldSearch. Quick & tested solution for MapsWorldSearch removal.